Over the years I have worn and thrown away several types of skate shoes. 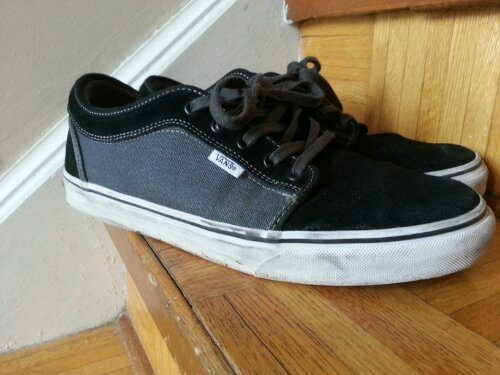 Some brands I have worn are Circa, Globe , Fallen, Airwalks, Element, DC and Vans shoes. So I guess what I will do is review some brands I have worn and help you make an educated decision if you chose to buy a pair. and tell you my favourite I have worn so far. Positive: They make great shoes with a great variety of colors and designs. They are comfortable and fit well. Negative: The colors on the suede wares quickly if they get wet. Also I bought my first pair of shoes for back to school and within 2 months, the soles were falling off and leaking! Positive: They are relatively affordable, have a unique look. Negative: Stain easily, are not very comfortable over time. Positive: Soles last long without much wear. Colors don’t fade fast. Negative: Sizes that I have tried fit large, shoe backs ware quickly. Negative: In my opinion not very stylish and they are heavy, although I haven’t worn these in about 6 years haha. Negative: Most styles look similar, back of sole splits. Positive: Come in a variety of colours and have unique looks, also you can often find them at a discount, comfortable padding inside. Negative: The shoe is kind of bulky with a lot of padding making it heavy and more difficult to do active things with it like biking and running. However they are ideal for a lot of skateboard riders but not much else. Positive: They are light and without sacrificing comfort, they come in a large variety of unique colours and grip to the ground and my pedals well with their unique waffle pattern. they are also sleek so you can wear them when dressed up also and they don’t stand out. Negative: I honestly can’t say much negative about them. They are my favourite brand I have worn so far. If I could think of one thing it would be the sole should be stitched in instead of glued, however my soles have not pulled away yet and I have been very hard on them and wearing them in snow. Overall I have grown to love the look and feel of wearing skate shoes , and they go along with the style I have. People may have their own preference on what they would like to wear based on what they are doing , like biking or skate boarding and other things. For what I do my favourite brand I have worn is Vans. I have had them for 3 months and they are still in great shape, even after going to the bike park with them and wearing them.